Adolescents and adults with autism go through similar physical and emotional changes as their neurotypical peers. But they also have challenges which require specialized training and accommodations for them to cope and function in the workplace. This is where the expertise of job coaches like Teacher. Dominic Cheoc, an occupational therapist, prove invaluable in transitioning PWAs from the school to the work environment. Teacher Dom is also a sibling to a young man on the spectrum. “Where to go NEXT: Preparation for Employment” was at the Autism Society Philippines National Headquarters last 30 July 2016 and was attended by 45 professionals and parents. Teacher Dom gave the participants an extensive overview of the characteristics of adolescents and adults with ASD, the different available options for employment, how and what to do to prepare them for employment, the importance and process of making an individualized transition plans and the role the job coach in achieving the goals of the transition plan. He shared several practical tips and techniques such as Communication and Two-Way Interactions to make the adjustment easier for PWAs. PWAs have strengths and capabilities (their honesty, good memory, attention to details, among others), which make them good employees; but there are also barriers (willingness of companies to hire PWAs, lack of knowledge, odd behaviors, among others) which they need to overcome to get them employed for the long-term. Job coaches teach PWA’s to do their work tasks well, as well as to structure accommodations in the work environment to enable them to work independently, with the support of supervisors and co-workers. 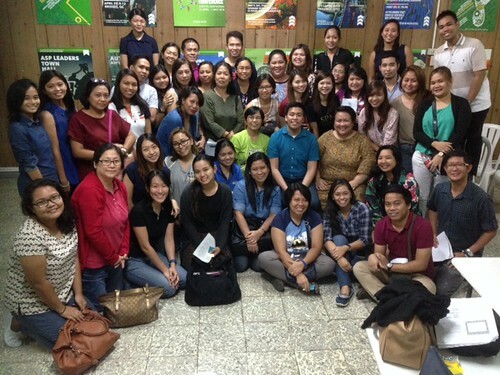 The Autism Society Philippines recently launched the Autism Works initiative, which creates employment opportunities in compassionate workplaces and empowers PWAs towards success at work. If you are a PWA interested in employment or a business keen on building a neuro-diverse workforce, please send an email to autismphils@gmail.com. About the contributor: Lloyd Ngo worked as an ASP intern when he attended Independent Living and Learning Center. He began working in 2012 as an encoder at the Ongkiko Manhit Custodio and Acorda Law Offices in Makati. He is currently ASP’s Program Assistant for Communications.